Sleeps Up to 10 Guests, Stay Right On the Lake! 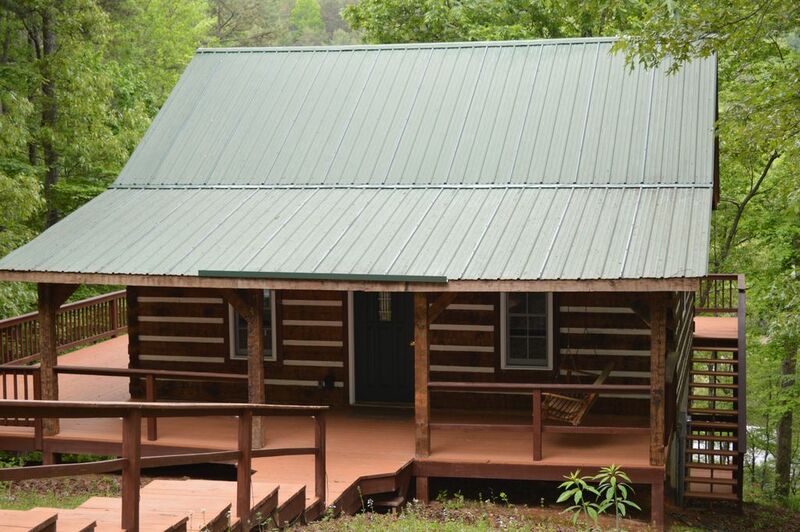 Come Relax at Our Peaceful Log Home in the Woods. Have All the Comforts of Home As You Relax On One of Our Large Wrap Around Decks, Read a Book and Drink Coffee On the Porch Swing and Enjoy a Campfire at Night. located in the Smokey Mountains of North Carolina, Bear Paw Resort is the Only 24/7-gated Community On Lake Hiwassee. Behind the Secure Entrance is an 18-mile Lake With 163 Miles of Natural Shoreline and the Nantahala National Forest. Enjoy Fishing, Swimming, Water Skiing and Boating Around the Lake. Multiple State Records Have Been Caught in This Lake. Bring Your Own Boat Or Rent One at Mountain View Marina, a Full Service Marina Within Bear Paw Community. the Cozy Cove Cabin Sleeps Up to 10 People! Three Bedrooms With Two Queen Beds, a Double and Single Bed, Plus a Loft With Three Single Beds. This Cabin Has an Open Loft, Multiple Spacious Decks, Hardwood Floors and Sliding Glass Doors That Bring in Lots of Light. the Main Room Has High Ceilings and the Decks Have a View of the Lake and Our Fire Pit and Patio. Grill Your Fresh Catch On the Large Gas Grill On the Deck Or Cook Your Meals Using Our Fully Stocked Kitchen With Full Size Refrigerator, Coffee Pot, Microwave, Dishwasher, Utensils, Dishes, Stove and Oven, Pots and Pans. It Has Everything You Need Except the Food. Full Sets of Sheets, Comforters, Pillows and Blankets. We Also Have a Full Size Washer and Dryer, Central Heat and Ac . We Have Wifi, Cable Tv and a Dvd Player. Park Your Own Boat Or Canoe at Our Private Floating Dock With Seasonal Water Access. We Have Made Our Home Comfortable and Cozy Because We Vacation Here Too. the Clubhouse Has a Large Swimming Pool, Basketball Courts, a Tennis Court, Exercise Room, Children’s Playground and a Catch and Release Pond. local Attractions Include White Water Rafting and a New Casino in Murphy. book Now! Last Minute Reservations Are Available. Multiple fishing guides are also available. We have personally fished with Shane from Big ol' Fish multiple times and have had a great experience. He can also arrange to pick you up right from our dock. You can contact him at www.bigolfish.com. Tell him we sent you! Lake Hiwassee is a working reservoir with a hydroelectric dam and therefore the water level of the lake varies greatly throughout the year. Typically the lake is filling in the spring and is full from Memorial Day to Labor day, and then lowers through the fall and is lowest in the winter. All the properties on the waterfront are affected by this. Some properties are on deeper water or have longer docks allowing varying degrees of access. Our dock is usually floating and fully accessible by boat from May thru September, however rain fall and power needs can affect these dates. There is no guarantee of the water level as this is completely out of our control. You can contact the local marina to find out the latest level for Lake Hiwassee. The Marina rents slips for a reasonable daily fee at their floating dock and it is accessible most of the year. There is also a boat launch at the marina that is free to use for anyone staying in Bear Paw resort. We wanted a comfortable relaxing vacation home on the lake for our family and friends to enjoy with us. We upgraded and decorated this house with all the comforts of home to make staying here a relaxing and enjoyable vacation. you can rent boats at the local marina. The pool is a gated pool in the community center. It is located just after you enter the community just past the main gate. A key for the pool is located in the cabin. Our personal dock is located just below the cabin, a short walk down thru the woods to the waters edge. The dock is a 10x12 foot floating dock. You can put your boat in at the marina and drive it over to our dock and tie up to our dock for the week. You can also swim from the dock if you like. The Hiwassee reservoir level is controlled by the dam. The water level is seasonal and at its highest point in the summer. It is full from Memorial Day to Labor Day. They start letting the water our of the dam after Labor Day. In the winter the water level drops 60 feet and our dock is no longer floating. You can still access the water and put your boat in at the marina, but you may not be able to drive to our dock during the low months. You can also rent boats from the marina. Cozy and comfortable. Owners very responsive to questions and needs. Felt like home. Thank you for being such great guests. We enjoyed having you and your family! The cabin was a great homeaway for our spring family fishing trip. We fished Apalachia and Hiwasssee lakes. A very roomy and livable cabin,all the comforts of home close to the lake. Being inside Bearpaw Resort gives you a chance to enjoy the pool ,basketball ,and other activities on the grounds. A very welcoming place ,we will be back in the future. So glad you enjoyed your visit, your group were great guests. Please let us know when you would like to come stay with us again! So glad you had a great time, please come back and stay with us again soon. We loved the house and area. My only suggestion is to update the kitchen sink and add better lighting. Fun weekend! We greatly enjoyed our stay here! Everything was clean and tidy. Directions to the cabin, and instructions for our stay were clear and concise. The property was quiet, and the lake was amazing, with affordably priced, local rentals. Traffic on the lake was minimal, allowing us to safely enjoy our time on the water. The locals were very friendly and informative. We also found the owners to be kind and easy to communicate with. Any question we had, received a thorough and prompt reply from the owners. (We even found that after our stay, if we had a follow up question or two, the owners responded quickly.) I guess they don't leave a place to rate customer service on this review, but you cannot overlook the reality - customer service always matters and for the owners of this property - customer service is 5 stars! Perfect for energetic family. Beautiful and quiet lovation. We walked into a beautiful log home and all stress disappeared. Our boys were in love with the loft sleeping area. There are no bedrooms on main level of house which was fine by us, never had to hear our kids. ##Caution## the property is very steep and Going down to dock has some steps but no hand rails. Not a location to take grandma with bad knees. Highly suggest if bringing more than 5 persons you bring at least 1larger skillet; basic set at cabin. Also bring Deep Woods Off and have something for poisin ivy just in case. Great Time. Great Memories.